If you just want the answer to that link-bait headline question, scroll down to the picture of the map with every country scratched off. Of course, methodology is critical, and you should really conduct your own study, so stick around for the details of quite how to do that. But perhaps you’re not convinced of the need to do that, so first, as is traditional before the introduction of a ridiculous solution, let me sell you the problem. If you listen to music in an office, the advent of Spotify is a disaster. Superficially, of course, Spotify is clearly better than a regular music radio station, in that it has no ads, and most importantly you can put on exactly what you want to hear. Oh yes, listening to what you actually want to hear – clearly the best of all things to listen to. Or is it??? There are two big problems with this in an office setting. One is the burden of choice. You want perhaps 8 hours of music in a day, 5 days a week, without much repetition. That’s actually a lot of work to put together, and when trying this we perhaps better understand why people get paid to make radio happen. The second problem is consensus. When there were five of us in the start-up I worked for, Stubble & Glasses, we discovered the only artist we all liked was Paul Simon. By the end of the first day, we knew we were going to need another office music strategy. And then we hired a bunch more people – some of whom, weirdly, didn’t like Paul Simon. With radio, you accept that you’re not going to enjoy everything. So perhaps your office needs a communal Spotify playlist, which everyone can contribute to, and which also solves the tremendous burden of choice problem, since you’ve divided up that labour. And you like some of what you get to hear, and some you have to tolerate, but it all sort of evens out in the end. Because when you pick songs for a communal list, your individual incentives are not aligned with the group incentives. As a diverse group, your collective enjoyment will be higher if people pick the blandest, most widely-appealing artists they like. But as an individual, you want to listen to music that really speaks to you (which is usually not bland, and often not widely-appealing), and you also don’t want to “waste” your part of the list by choosing something that somebody else might add anyway. So you’ll be tempted to add the least bland, most personal, and least universally popular music you know. And so will everyone else. And you’ll hate it, and eventually each other. What about Last.fm or Pandora, then? Also terrible in this context. Both services are brilliantly designed for an individual, but in much the same way as the above, what’s good for one is usually bad for the group. Unless you know how to make large physical love/ban buttons for the whole office to enjoy, but even then the service is going to get very confused if you have any diversity in music tastes. But radio is so 19th Century! I know, this seems insane. With all the developments in technology and music services, there just has to be a way that the internet makes the concept of radio better. Well, there is. And I’m going to stop phrasing minor problems in a melodramatic fashion and using subheads in a faux conversational style so I can tell you about it. You would probably shrug, because you already knew that. TuneIn radio and others have facilitated this for a while now. And with 70,000 radio stations, it doesn’t seem as if you’re making the burden-of-choice problem any better. How are you supposed to find anything good? Now simply rotate through your favourite discoveries! I will immediately confess that this solution is actually insane. But it’s insane in a good way. Because as soon as you start, you run into definition problems. Delicious, arbitrary definition problems. When we tried this at Stubble & Glasses, here’s how we solved them. How long counts as a listen? 4 hours of listening per country. Long enough for you to get a good feel for the station, short enough that you can survive even the least palatable options. Inevitably, definition problems resist even these seemingly simplistic answers, so if you really want to do this, check the Nitty Gritty section below. There are 193 members of the United Nations. If you used our 4-hour minimum listen rule, you could in theory get through 10 per working week, and in this way you could be done inside of 4.5 months. In practice, if you use the map as your guide to what counts as a country, and if you split up large countries on the basis that that would be too easy (see Nitty Gritty below), and if you accept that I’m massively overblowing this by saying it solves office radio and you only manage to listen to 3 world radio stations a week (as we aimed to do), you’re now up to 228 listens and a 1.5 year project. Oh, but when you get towards the end, you’re going to discover all the problems with your seemingly simple and elegant definitions, as you search for radio stations for Arctic islands with populations under 1,000, and okay, you can come up with something to get around that (see Nitty Gritty), but this is going to slow you down. So much, in fact, that the business folded when we were 1.6 years into the project and 93% done. So I took the map with me and finished it mostly alone. 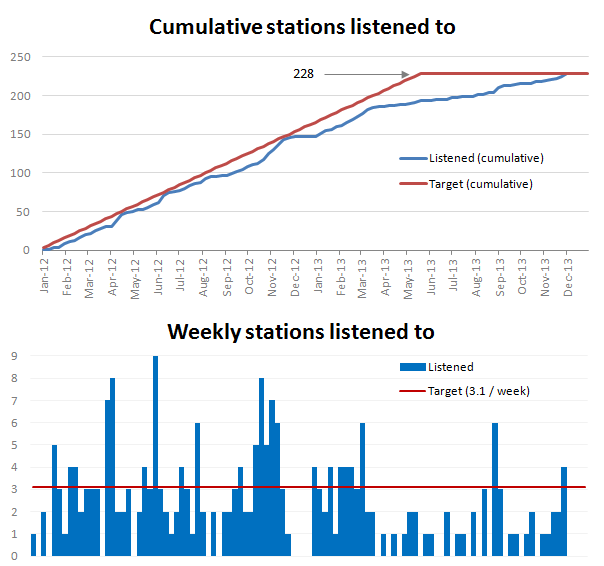 Our listening progress. Note the inflection point around March 2013 when it gets much harder. 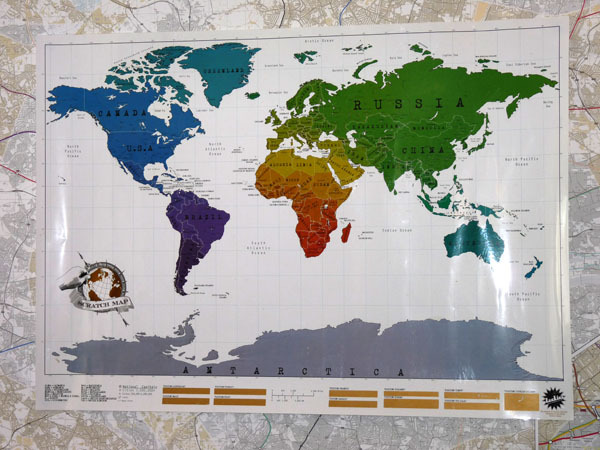 The Luckies Scratch Map we used appears to use the Gall stereographic projection of the globe. 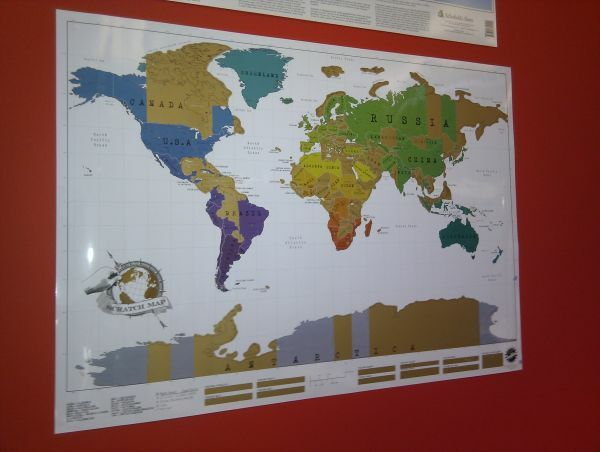 This projection attempts to compromise between accurately representing the relative areas of the countries and accurately representing their shape, which sounds like a good idea, except of course that this means it achieves neither. As usual, the problem of area is more noticeable, and although it’s not as extreme as the Mercator projection, the area of territories towards the North and South poles are significantly overstated. 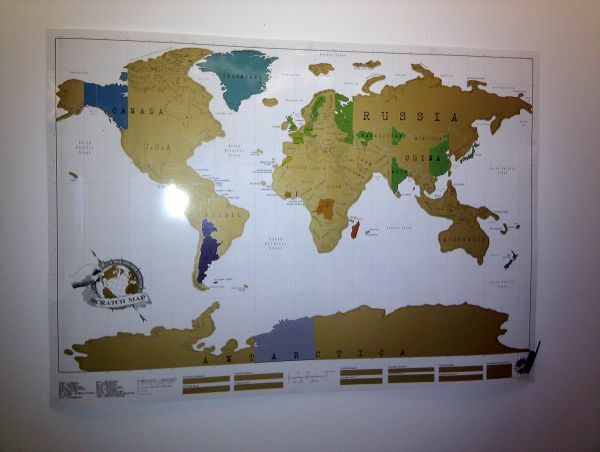 Perhaps this is okay if you’re using the map to more conventionally record your travels, as getting to Antarctica or some of the isles of the far North is a pretty big deal, and the bigness of that deal is then represented by the amount of scratching you get to do (especially for Antarctica). But in the case of a radio tour, it’s unsettling. There are also some covered rectangles below the scratch map which you are invited to remove if you’re visiting certain specific countries. It turns out these reveal a range of oddly-chosen pieces of trivia, only those for Iceland and Fiji being particularly useful if you were planning to go there. The final rectangle is to be scratched off if you are visiting “Luckies Island”, which you may notice does not exist, but is nonetheless shown on the map in the Mediterranean. The inclusion of this kind of Mountweazel may be intended as a copyright trap of some kind, and was quite fun to discover, but it will be highly unnerving for pedants or completists. In our case, we resolved that we could scratch off Luckies Island only once we had completed the rest of the known world. We could then finally scratch off the mysterious rectangle under “Visiting Luckies Island?”, which turned out to be a bit anticlimactic. Of course, with all that said, it’s still an excellent product that made this entire enterprise that much more visceral and compelling, so you should probably click on this affiliate link and go buy it. Some countries are much larger than others. (Actually some countries are 38.8 million times bigger than others, if we happen to choose the largest and smallest). So listening to just 4 hours of radio and then scratching off the entirety of the US or Russia seems disproportionate. So we made an additional rule: if a country covers an area larger than one latitude/longitude grid area, then one must conduct one listen for each longitudinal band it covers, ideally to a station that originates from within that very band. This was a mistake. Don’t do this. The challenge is ridiculous enough already, and if you worry about land masses you should really also worry about population density, and possibly representativeness-of-music, and the whole thing gets rapidly out of hand. I mean, Antarctica, right. According to TuneIn, the only station (as I mentioned above) is A-net, which may or may not really be in Antarctica, and in practice just plays a selection of lovely acoustic guitar folk and suchlike on a loop less than 4 hours long. Now, although it has what sounds like an acoustic version of the Inspector Gadget theme (even better than this version; actually ‘Topsy’, a guitar duet by Duck Baker and Jamie Findlay, which I can’t find streamable on the internet but here’s another version), and acknowledging that the general mood of the station is ideal for crying to when your business is closing and you’re the last person left in the office still doing this, we have to face the fact that Antarctica does cover all 24 longitudinal regions, which according to the above rule means 24 listens of 4 hours each, which is 96 hours or 12 full business days of listening. Which is just silly. (We did it anyway, because you’ve got to stick with the rules you create, or where are you really). The next problem is countries/regions with no detectable radio station, or in some cases any human population at all. For that last resort, one can just search Spotify using various related keywords and in this way construct a 4-hour playlist of tenuously related music, and so ultimately justify scratching off every part of the world map. Having spent 2 years listening to radio stations from every country in the world, or in some cases music tenuously related to that country, I can now authoritatively list the Top 5 best* radio stations. The station that started our entire tour. Tom Hensby (who you may know as one of the Three Englishmen) introduced us to this station, with its eclectic mix of genres and musical oddities, alongside a legally mandated portion of French music (also eclectic and odd), all introduced in French by presenters with fabulously sultry tones. To get an idea of their range, you might also find silly musical numbers from 50s musicals, or a lovely cover of Aquarela do Brasil. We reasoned that if one such incredible radio station was accessible via the internet, surely others could also be found, and this was the main motivation to listen to music from every country. Fip set the bar against which all others would be compared, and a little sadly it turns out that Fip was impossible to beat, but four other stations came very close. Overview: As eclectic and consistent as Fip, but more of an emphasis on songs with lyrics and a somewhat less soothing overall effect. Overview: Also eclectic and consistently good like Fip, just not quite as many jump-out-of-your-chair-what-are-we-listening-to moments of amazement. Overview: The Russian language works for this station in much the same way as French does for Fip; unintelligible (to us), but pleasing on the ear. Also consistently good and highly varied, but a slightly stronger Western / pop influence, more likely to produce some songs we already loved. Overview: The one stand-out radio station we enjoyed that wasn’t earnestly eclectic and wilfully obscure; a mix of French and/or bollywood tunes (and occasionally Western) with a consistently upbeat vibe. As mentioned above, this was the only station listed on TuneIn as being based in Antarctica, and while it’s quite beautiful to imagine someone out there broadcasting a lot of chilled out acoustic guitar, it doesn’t seem plausible. But you should definitely check out their super 90s website and judge for yourself. It’s also fun to read the comments on Guillory’s “Somewhere in your heart” to hear from other A-net fans. A-Net’s playlist isn’t that long, so you should definitely check it out (either on TuneIn or their website) when you want to remember someone special, or if you’re closing up shop on the last day of a business that was outlasted by a project to listen to radio from every country in the world. I’d say it’s ideal for either of those occasions, and possibly more. The slightly sad thing is that once the joy of accomplishment wears off, you realise it just looks like a normal map now. *”Best” based on a very limited sampling of radio stations available in each country. Ratings are also entirely subjective. As is everything, really. 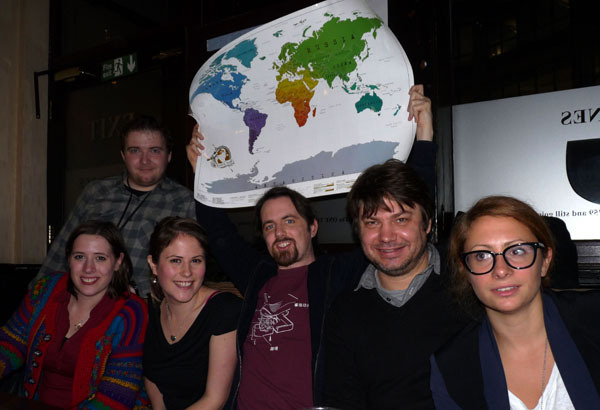 Part-way through, Ben Pindar wrote about the radio world tour for our company blog, which has since gone away. I’ve put up a copy of his original post here. Epilogue [added 12th January 2014] – what do you mean “Best”? After posting this, I’ve seen some comments that made me realise my implied position on the definition of “best” might not be quite clear. Typically, I think people do assume that an article proclaiming the “10 best” of anything will not actually provide the objective ultimate truth of the matter. It’s unlikely that the reviewer will have sampled the full range of contenders, and it’s certain that taste is subjective and an actual “10 best” list can never be compiled in a perfectly objective way that everyone will agree with. As mentioned, everything is subjective anyway! We did this hundreds of times! So while I think it’s impossible to compile a “true” list of the best radio stations, this method does produce a shortlist of stations that I expect to be much more rewarding than the average “top 5″ list. And if you don’t find it to your taste, then you can of course conduct your own global search in much the same way. Good luck! Tim Mannveille tweets as @metatim, and likes to overcomplicate things while on holiday as well as well. This entry was posted in game and tagged music, overly-complicated, radio. Bookmark the permalink.